Green growth is a myth. Because it ignores the social, political and personal dimensions of sustainability, it can never cut deep enough into the structures of self and society to secure solutions to the crises that we face. Credit: Post-Growth Institute (http://postgrowth.org/). All rights reserved. In discussions of the future of economic growth, ‘business as usual’ is not an option. The alternative, say many, is “green growth:” growth that is resource-efficient, low-carbon and socially-inclusive. In this line of thinking, green growth is the key to managing climate change, bringing eco-friendly development to emerging economies, renewing economic structures in industrialized nations, and creating more jobs to employ a rising population. Unfortunately, green growth is a myth, or at least an inadequate response to the challenges that lie ahead. Because it ignores the social, political and personal dimensions of sustainability, it can never cut deep enough into the structures of self and society to secure a solution to the crises that we face. In some shape or form, green growth is already happening. In Germany, for example, both energy intensity and energy consumption have declined slightly over the past 20 years, while GDP has steadily increased. But Germany has achieved this largely by doing away with lots of its own energy-intensive industries, and outsourcing this part of the supply chain to other parts of the planet - most notably to China. The same is true for the UK economy, and that’s the key issue: what happens to green growth when there’s nowhere left to outsource the most important causes of your problems? The central concept of green growth is “decoupling:” in other words, how to increase the efficiency of the economy by detaching production from its current heavy use of finite resources. The idea is that the ‘greener you shop’, the ‘more the earth is saved.’ So, for example, new technologies mean that the air coming out of a car at its rear end can be cleaner than at the front, while fuel is actually saved in the process of driving. Examples of “relative” decoupling abound, as in German and UK economies above. However, there’s no evidence that green growth leads to any “absolute” decoupling or permanent reduction in ecological impact, whether through lower carbon dioxide emissions, reduced extraction of raw materials, or less biodiversity loss. Fuel consumption per miles travelled may be declining in these economies, but total consumption is growing; refrigerators may use less electricity, but there are far more of them in use and their combined ecological footprint is increasing. Growth is still growth, even if it is more energy efficient. In this sense, decoupling is also a myth. The social and human consequences of absolute decoupling are profound, and that provides a clue to the continued popularity of green growth, even though it can’t deliver on its promises. After all, it’s still growth, and growth exercises a powerful hold on the imaginations of policy-makers across the world. The appeal of green growth is clear: little fundamental has to change. Policies can be that little bit greener. Business models can incorporate more corporate social responsibility. But the underlying structures of unsustainable economies and lifestyles remain the same. The problem - identified by proponents of an “End to Growth” or a “Great Disruption” - is that ecologically, any kind of growth pushes against the limits of a finite planet: the rising economic costs of climate change and resource extraction (especially unconventional gas and oil via hydraulic fracturing and tar sands). Economically, there are clear, diminishing returns to growth in most industrialized economies. In this sense, post-growth or de-growth become the ‘new normal’ of economic activities. The same is true for productivity gains: the more efficient a process becomes, the more difficult it is to squeeze out that extra one percent of increased productivity. Mats Larsson even argues that “innovativity” - the ability to innovate new products and production processes - has inbuilt limits. If a product can be produced at zero cost and in zero time, no more innovation is possible. With advances in information technology, that possibility is rapidly becoming visible. In post-growth or de-growth, the goal is not just to decouple economic activity from its ecological impact, but to destroy the connection completely. For example, renewable energy production can supply energy at zero variable cost. If the infrastructure required is also produced with renewable energy and recycled materials, then the ecological impact could be zero. The de-growth movement calls for a voluntary contraction of Northern economies via shorter working hours, the redistribution of wealth and income, increased subsistence production and collaborative consumption, and the promotion of non-monetary, commons-based economic interaction. Some room for economic growth will still be left for Southern economies to develop until the bulk of the global population moves out of poverty. In this vision, the goal is a “steady state” economy which is both ecologically sustainable and socially equitable: where the physical size of the economy stays within the carrying capacity of planetary boundaries, while at the same time ensuring a fairer distribution of, and access to, all natural and social resources. 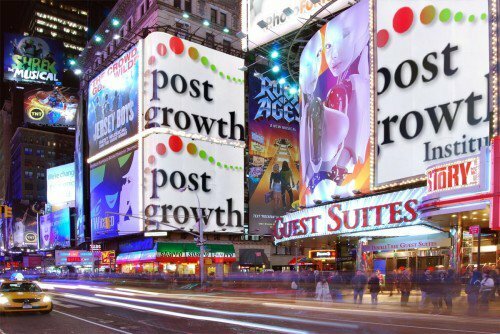 Post-growth is not just an economic goal - it’s the key to the realization of a just society. The narrative of post-growth does have its problems. An economy that doesn’t grow might look rather dull. “Steady state” appears to imply a static economy, perhaps even a static society. However, even if the German economy, for example, does not grow, it would still need to produce and sell products and services worth $3.5 trillion in purchasing power parity each year in order to maintain its GDP. Are green growth and post-growth incommensurably at odds? Some say “yes.” Ralf Fücks, president of the green political think-tank Heinrich-Böll-Stiftung in Germany, argues for renewed optimism about the possibilities of green growth via new technologies, new forms of social innovation, new taxes on resource use, and “green” ordo-liberalism, the German approach to economic questions that sits somewhere between social liberalism and neo-liberalism by emphasizing the role of government in ensuring that market actors are able to produce socially and ecologically desirable results. From a post-growth perspective, all of these levers are useful, but they leave out crucial regulatory changes in the financial sector, measures to promote large-scale wealth redistribution, reduced working hours, and encouragement for commons-based forms of economic activity. Post-growth advocates like Peter A. Victor and Tim Jackson focus more on these areas because they actively reduce growth or make economic and social systems less growth-dependent. In the green growth paradigm, ideas about sharing and the entire notion of the collaborative economy are missing. But if these social, political and personal innovations became part of the paradigm as well as technology, then green growth might actually be able to deliver on its promises, so long as relinquishes the belief that growth is an end in itself. However, doing this represents a huge challenge to the ways in which societies are currently organized, politics are structured, and patterns of consumption and cooperation are internalized in personal values and behavior. The social, personal and political implications of de-growth are enormous, which is one of the reasons why green growth exercises such a hold on the conversation. For example, reduced working hours would help to create more time for community and cooperative activities, as would a guaranteed basic income for all. With that foundation in place, people would be released from the treadmill of having to earn more money to finance their habits of over-consumption, and social security, pensions, and universal healthcare could be ensured. This would also make social security systems less dependent on continued economic growth. These collaborative forms of economic activity rest on the development of new forms of entrepreneurialism and alternative monetary systems like local or virtual currencies, which establish a second monetary system alongside fractional-reserve banking. We might call this new post-growth economy a “civil economy”, a productive economic system beyond the growth imperative that promotes every kind of wealth in cities and communities - cultural and human as well as social and economic. Taken together, these steps would change the physical, economic, social and mental infrastructure that surrounds us in fundamental ways. They will create a new normality in which we use resources collaboratively, create and live out values beyond the monetary, foster closer social ties and community cohesion, and abandon the relentless call of perpetual economic growth.